Not with P-Diddy, but just as fabulous? 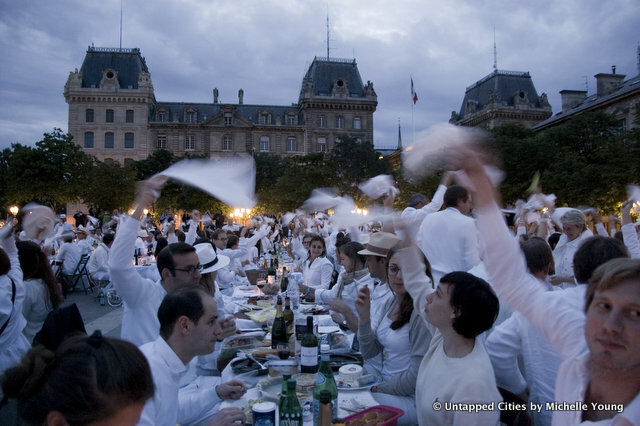 The Paris Dîner en Blanc or The White Party, an invite-only secret dinner party descends upon a different and very public location each year: The Arc de Triomphe, Concorde, The Invalides…It’s so secret in fact, that even those connected by blood to the organizers do not know. The location is announced upon boarding pre-arranged buses that take the invitees to the dinner spot. Everyone must wear white, bring dinner in a picnic basket, chairs, table and champagne. You exchange food and dates (temporarily) with those around you. From those interested in the history in 1988, the first official Dîner en Blanc took place in the Parc de Bagatelle in the Bois de Boulogne, started by a man named François Pasquier, who invited a few friends to the Bois de Boulogne one day in June on his return to France after being abroad. To find each other in the park, they all wore white. The dinner was such a success that they decided the next year, each person would invite some other friends and the event grew organically into the 10000+ dinner it is today. From a preservation perspective, we have always been impressed by the progressive view the Parisian government has on the usage of venerated architecture, permitting large electro parties to happen in the Grand Palais and other formal institutions. The police no longer try to break up the Dîner en Blanc, but we still think it reflects the spirit of Paris and its constant reinvention of history on already storied locations. It also raises an interesting question about preservation: do we over-protect historic buildings in America, thereby preventing the current generation from putting their imprint on the spaces? Perhaps preservation should also mean participation. Here’s a look back to the prior locations of the Paris Diner en Blanc! The 2016 Dîner en Blanc brought the pop-up dinner to a location that had not worked out due to construction back in 2012 for the 25th anniversary: the Place Vendôme. I went to the event quite a few years ago and was brought along by my friend’s mother. You’ll have a fabulous time! I was just wondering if you could email me after Thursday – I’m just trying to work out how they contact you for the event details and such. I’m trying to work out how to do it in Australia but I just need to work out the logistics. Please let me know if you can – it would be wonderful to bring this to another part of the world! yay!! can’t wait to see pics. i miss you, coca-cola and smelly pack smell already!